Michigan Air Solutions, an industrial compressor and air systems distributor, initially contacted us to redesign their website. After reviewing their analytics we discovered that they were receiving only 1-2 website leads per month from their website. Step 1: Develop Personas: A persona is a detailed description of your ideal customer or target audience which helps focus your marketing messages. We created three main personas which included information about their needs, issues, goals, demographics and phrases used in search engines. fits and points of differentiation. We asked why a prospect should choose Michigan Air Solutions over a competitor. This resulted in several strong positioning statements that were used as headlines in their marketing materials. Step 3: Professionally Designed Website: We helped Michigan Air stand out from the crowd and build trust with a well designed site that is mobile-friendly, easy to navigate, and clearly states key messages (including brand positioning). We also added an online store for parts and used equipment, creating another revenue stream. Step 4: Content Development: We created blog articles, landing pages and offers that addressed users’ issues and needs. Blog articles are also instrumental in helping Michigan Air rise in the search rankings. Step 5: Search Marketing Strategy (SEO): We identified which keywords the personas are using and created corresponding blog articles, content and landing pages. Those pages were then optimized for the search engines so they will rank higher in the search results. We also created pay-per-click (PPC) campaigns to supplement organic search efforts resulting in a dramatic increase in traffic. We then fine-tuned the ad campaigns to keep costs down and engagement up. Step 6: Email Marketing: Instead of blasting out a monthly newsletter, we recommended segmenting the email database and sending content that is more targeted resulting in higher open rates and website visits. Step 7: Social Media: We implemented a LinkedIn strategy that raised awareness and helped the sales team connect with more prospective customers. 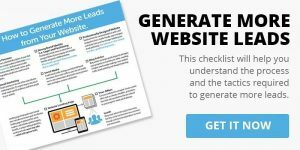 If you’d like to learn more about the lead generation process, our Lead Generation Checklistt will help you. If you’d like to discuss your specific needs and situation, feel free to schedule a call with us.